Sue Griffin is a self-proclaimed Passion Pusher and leader in the amateur sport and non-profit sectors. She brings 25+ years of leadership and managing organizational growth in the non-profit sector. Specializing in amateur sport, Sue was the first female CEO for the BC Sports Hall of Fame, led Tennis BC as Executive Director, and has provided services to the health sector including Eagle Ridge Hospital Foundation, Heart and Stroke Foundation, Canadian Cancer Society and BC Children’s Hospital Foundation. A sought after public speaker, Sue shares personal stories on leadership in a constantly changing and challenging world where long term relationships are the foundation for success. Healthy, focused, positive and high energy professional, Sue can be found on the squash courts in her spare time. Volunteer commitments include current Board of Director, Kids Up Front; Member of Squash BC’s Strategic Planning Committee and member of Jericho Tennis Club’s Governance Committee. She was also a past Chair of ProMOTION Plus. Bryna Kopelow, a member of JW Sporta: Health, Physical Activity and Sport Education Consultants, responsible for the development and management of Action Schools! BC (2004-2015) and the Premier’s Sport Awards Program (p.s.a.p.)(1985–2015). She is involved with numerous endeavours promoting physical activity and sport at a grassroots level and accomplishments include: Past Chair of the Canadian Association for the Advancement of Women and Sport and Physical Activity; Past Chair and current Honorary Board Member of Promotion Plus, past Board Member of Sport BC and current Board Member of BC Recreation and Parks Association, Motivate Canada and BC Wheelchair Basketball Association. Bryna is a member of the 2015 Expert Panel of the Formative Evaluation of the Canadian Sport Policy (2012) and the Thematic Reviews of Physical Literacy and LTAD. She was a member of the National Advisory Committee – Children and Youth and Physical Activity Guide, Canadian Society for Exercise Physiology and the National Roundtable Children and Youth and Physical Activity and a Sessional Instructor at UBC. She received her BPHE from the University of Toronto and Teaching Certification and Masters of Physical Education from UBC. Bryna and her husband have two daughters. Erin is a Royal Roads University MBA graduate with a specialization in leadership. Her MBA is supplemented with a Bachelor’s degree in Sport and Leisure Administration from the University of Victoria. Erin is currently teaching at Langara College in the School of Management’s Bachelor of Business Administration program and the Bachelor of Recreation Management Program. She is also the Program Coordinator responsible for the Bachelor of Recreation Management. Erin’s non- profit involvement includes the BC Snowboard Association – Secretary/ Treasurer, Up In The Air Theater Company – Director at large, and finally ProMotion Plus – Secretary. During her spare time she enjoys travelling, spending time at the beach in the summer, and skiing and snowboarding in the winter. She is a passionate participant in a variety of individual and team sports and fitness activities year round. Brenda Chinn is the Director of Sport at BC School Sports. She has over 30 years of sport administration experience including the UBC and University of Alberta Athletic Departments, Tennis Alberta and Tennis BC, and Canadian Sport Institute/PacificSport. A graduate of University of Alberta (MA in Physical Education and Sport Studies) and UBC (BComm), Brenda’s volunteer commitments have included Canada Olympic House in Beijing, NOC/NPC Assistant for Team Canada at the 2010 Olympic and Paralympic Games in Vancouver, World Cups and World Championships for Freestyle Skiing and Snowboarding, Wheelchair Basketball Canada national and international events, Canada Cup Wheelchair Rugby, as well as officiating in Whistler for Bobsleigh Canada Skeleton. Brenda has served as Team BC Mission Staff for multiple Western Canada Summer Games, Canada Summer Games, and Canada Winter Games including the upcoming 2015 CWG in Prince George. Jenny has worked for nearly 10 years in the field of sport & recreation. Her professional career in the sport sector began with the Provincial Sport Organization, Volleyball BC. At VBC, she worked with youth and adults promoting the awareness of ‘sport for life’ for eight years before making the transition to UBC. In her new role she has joined the Sport Facilities department within Athletics and Recreation. In this role she is fortunate to work with the full spectrum of sport on campus from Intramurals to Varsity. In her spare time, she coaches girls club volleyball and try to be the best weekend warrior that she can by playing flag football, basketball and beach volleyball depending on the season. Fortunately, running and yoga can be year round activities in Vancouver. Stephanie has volunteered with ProMOTION Plus for the past three years on the In Her Footsteps committee to lead sponsorship and prizing. Currently, she is the Manager of Youth Programs and Special Events for Basketball BC. She has held several other positions in the sport sector including Canadian Blind Sports, Volleyball BC, Field Hockey BC, and Boxing BC. Stephanie attended the University of British Columbia where she received a Bachelor of Arts in English. In 2011, she completed her Masters’ Degree in Sports Administration and Technology at the International Academy of Sports Science and Technology in Lausanne, Switzerland. Stephanie spends her spare time coaching various basketball teams including the Eric Hamber Junior Girls, Vancouver West Provincial Zone team and has just been named the Assistant Coach of the U-15 Basketball BC Girls Provincial Red Team. Stephanie volunteers for many non-profit organizations including KidSport Richmond and will be attending the TO2015 Parapan American Games as the Volunteer Sport Information Director for the Goalball venue. Marion Lay, an adjunct professor in the School of Human Kinetics at the University of British Columbia, was the founding president and CEO of 2010 Legacies Now. She is a founder and an honorary member of the board of Directors of ProMotion Pus, founder and past chair of the Canadian Association for the Advancement of Women and Sport and Physical Activity and was chair of the Vancouver 2010 Bid Committee and a member of the board of directors of VANOC, the organizing committee of the 2010 Olympic and Paralympic Winter Games. Marion is currently a member of the Board of Directors of ParticpACTION, she was a founder of WomenSport International, founder and chair of the National Sport Centre-Greater Vancouver (now the Canadian Sport Institute Pacific), and a former executive member of the Canadian Olympic Committee. 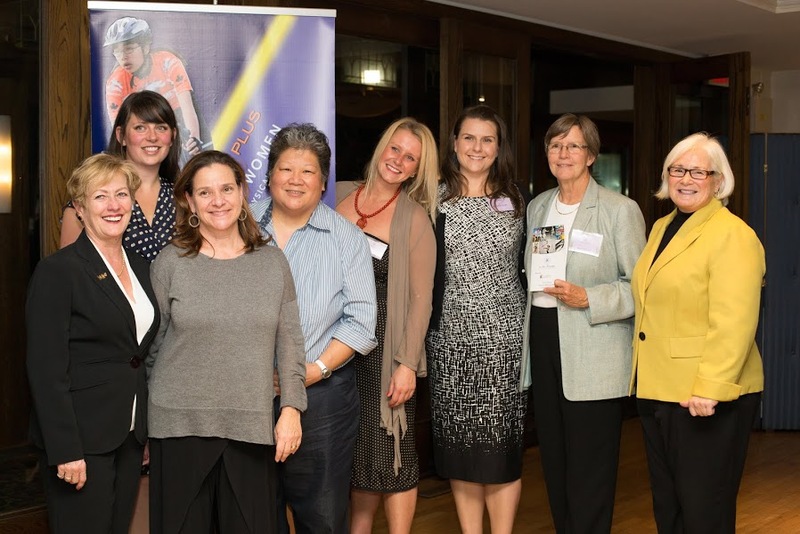 Marion has won numerous leadership awards, including the International Olympic Committee’s Women and Sport Trophy for the Americas, and the YWCA Woman of Distinction Award, and most recently, was awarded an Order of BC for her outstanding contribution as a leader in sport. Marion is currently the President and CEO of Think Sport Ltd a management consulting firm in sport and physical activity. Megan is a Key Leader at ivivva by lululemon Athletica where she is responsible for leading girls ages 6 – 14 through goal setting sessions, fundraising, planning and executing impactful community events, providing opportunities for girls of all skill levels to take part in recreational physical activities. Megan received her Bachelor of Education in the Montessori Cohort from the University of British Columbia. She is currently teaching Kindergarten. While completing her Bachelor of Arts, Recreation and Health degree at the University of Victoria, Megan was Co-Captain and Varsity Coxswain of the of Women’s Rowing Team. Megan has a passion for physical education, health and wellness. With over 9 years of leadership experience Megan is committed to increasing opportunities for girls and women in physical activity and sport. Becca currently works with the Gladstone Community Schools Team and volunteers with Girl Guides of Canada. In both her job and her volunteer work, she actively promotes physical literacy, sports and physical activity with children, youth, and adults. This is done through training, mentoring as well as program and resource development. It was Girl Guides that first encouraged her to try a variety of physical and non-physical activities in a safe and accepting environment. She was the recipient of the 2016 Bobbie Steen Legacy Award for her work with the Girl Guides. These positive experiences led her to pursue a career in recreation. Becca graduated from the Recreation Program at Langara College with a Diploma in Recreation Leadership and a Bachelor of Recreation Management. The program instilled the importance and impact of living a healthy active lifestyle. Although Becca did not grow up in competitive sports, her education and experience in the recreation field enforced the value of developing programs that are inclusive, build confidence and empower people to participate in a range of physical activities. When not working or volunteering, she enjoys a variety of outdoor activities such as camping, hiking, kayaking and scuba-diving. Erica Marrello is a graduate of Langara College with diplomas in Business Management and Marketing Management. She initiated her own event management business in 2015 (fullcircleproductions.ca) and was instrumental in the success of the 2016 ProMOTION Plus In Her Footsteps event. Her other activities include organizing events in various sectors, including charity events. She has been active and involved in sports her whole life including dance, soccer and dodgeball in both, the Algarve, Portugal and Vancouver, BC. Her passions are event management and social media and in her words, she is “ready to take on ProMOTION Plus’ online presence to advocate for women in sport, raise awareness, and engage with our community”.